ICOs (Initial Coin Offering) represent an increasing source of financing for startups, particularly in the field of Fintechs, through fundraising via the Blockchain. As of today, the ICO market poses a number of security and trust issues, largely because there is no investor control mechanism once the ICO is complete and funds are raised. A study of Satis Group published in March 2018 categorized 81% of ICOs as scams, 6% of them as failed, 5% as officially dead, while only 8% of projects examined were successfully listed on an exchange. The SEC, the gendarme of the American Stock Exchange, has even launched a fake ICO called HoweyCoin to educate investors about these drifts and the risks involved in these fundraising mechanisms. Even for real projects that have been successful in raising funds, investors have very little control over the progress of the project, the future of the company, and ultimately the funds they have invested. Most companies launching ICOs request an investment in Ethereum, and once the Ethers are on their portfolio, there is no easy way to force them to meet the commitments made when the whitepaper was published. 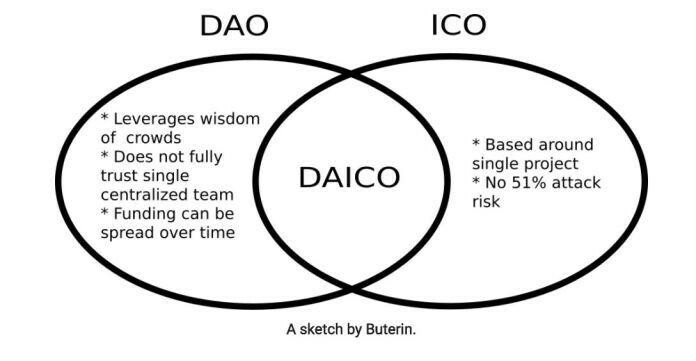 DAICO is a new fundraising model designed to overcome these problems and combine the benefits of DAO and ICO in a simple way. This new mechanism, proposed by Vitalik Buterin on January 6, 2018, in an article available here, aims to provide additional security and control to investors. Investors are able to choose the monthly budget allocated to the team through a quorum, and simply destroy the contract in order to recover a proportional part of their investment if they deem the team irresponsible, or fraudulent. The development team that aims to raise funds for its project sets the contract. The latter contains the details of the upcoming sale: whether it will be capped or not, Dutch auction, an interactive coin offering, sale with KYC and dynamic per-person caps, or any other mechanism. Once released, the contract starts in “Contribution Mode”, and allows investors to contribute to the contract (project) by sending ETHs and receiving tokens in exchange, according to the specificities defined by the team. Once the collect period is finished, it is no longer possible to send ETHs and the initial token balance is defined between the different participants. Following this phase, the tokens become tradeable. When switching to resolution mode, the contract has a main variable named “tap” that is initialized to 0 by default. The tap determines the amount of ETH per second that the project team is able to withdraw from the contract, in order to protect the investors’ funds. Investors may use their tokens to vote for an increase in the tap, if they deem this necessary. The team can reduce the tap without recourse to a vote. Investors may also vote for the self-destruction of the contract, which will switch the contract into a withdrawal mode, and in doing so will proportionally redistribute the ETHs that have been invested back to token owners. DAICOs are based on a virtuous system, requiring real investor involvement. Investor education is therefore crucial, as passivity or emotional decision-making (eg the price of a token) can hinder the security of the mechanism. For the system to work properly, it is necessary that there is a constant involvement of token carriers throughout the life of the project. A possible drift is the majority allocation of tokens to the team of developers, which could allow them to have the majority of votes, and even more so if the community is passive. The team could then change the allocation of funds, or even assign them completely. It is, therefore, necessary for token holders to ensure vigilance on the distribution of voting rights. The project team can also divert funds from their original use, but this kind of scam can only last for a while before the community reacts, with the possible consequence of canceling the project altogether. These new fundraisings, while perfectible, have the power to restore a degree of confidence in the ICO, while allowing investors to fix control modalities with flexibility. Through Blockchain technology, they ensure both the sustainability of projects and the protection of investors, without the need for state regulation.